I wasn't sure which outfit I wanted to emulate from the show, so instead chose a fabric from my last trip to Mood that I felt Megan Draper would possibly wear. The fabric is woven and a thicker weight, almost like a light canvas. P.S. I'm a Megan lover, not a Megan hater. Why do people hate her? I think this dress holds the record for the most time I have spent on a garment. I traced the pattern, sewed a muslin, retraced the pattern (went down a size from the original muslin, did a FBA, went in an additional size at the shoulders), made another muslin, and then got started on the final dress. While the fit is still not perfect (will it ever be?) I am still pretty happy that I corrected the initial problems with the baggy shoulders, tight bust, and baggy front. Doing a FBA made such a huge difference, but man, it was NOT fun making the changes for a princess seam bodice. Thank you to those of you that gave me suggestions and help on the fit! Oh, I guess I should tell you which pattern I used, huh? 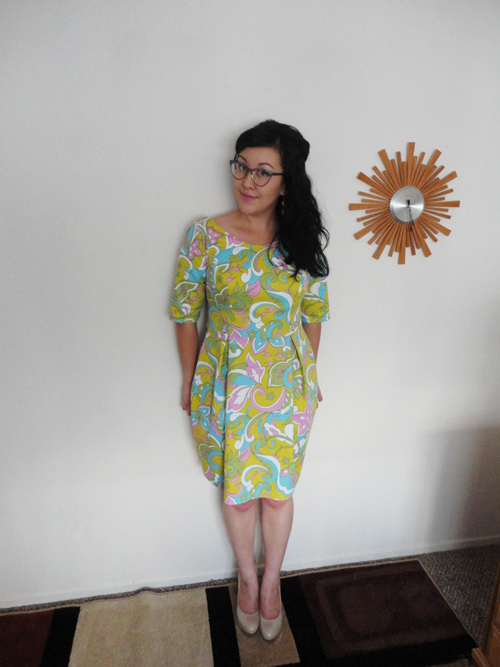 It's the Elisalex dress by the ladies over at By Hand London. Thanks to the sew along they are hosting I was able to sew the pattern with little confusion. The dress stands up much better on the form. Speaking of hems, I took a lotttt off the bottom of the dress. Nine and a half inches to be exact! If you use this pattern I highly advise you to lay out your pattern pieces before buying fabric. I ended up using close to a yard less than the recommended amount. 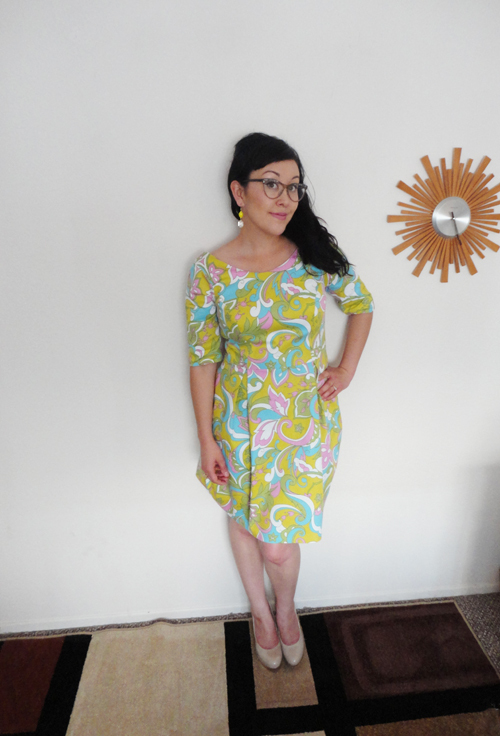 Thanks for putting this sewing challenge together, Julia! Gorgeous!! The fit is perfect!! 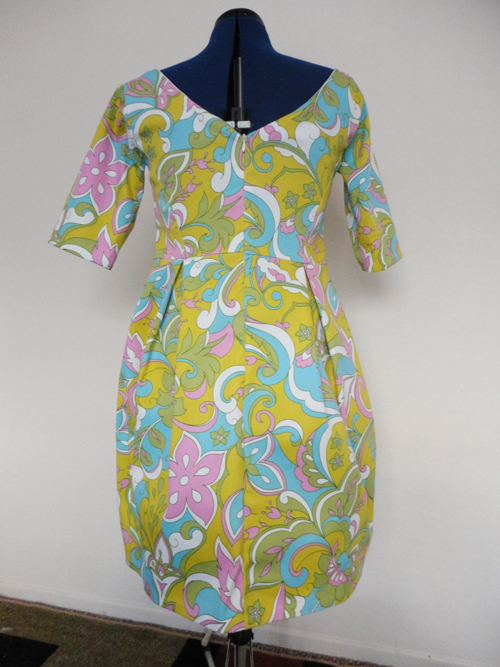 And gosh, does anyone wear these bright 60's inspired fabrics as well as you? No, I don't think so. Not even Megan Draper! It is beautiful. It may not be a *perfect* fit, but it sure looks like it is! Also, Megan is awesome. She has the best clothes, a fun personality, and is great with Sally. Awesome dress! All that work really paid off, you got a great fit!! I don't know why people hate Megan - I think she's pretty perfect! And so is that dress! You look great in it and the print is perfect for the era. Also loving the pleats ! Oh, I love this pattern, and your version is great! Such a fun print, and the fit looks spot-on in photographs. Your dress is gorgeous, I absolutely love the fabric. LOVE it! Megan would totally wear this, the fabric is awesome! This is so gorgeous! I just love that fabric and it looks perfect for the pattern too - your pleats are lovely and crisp and the shape of the dress is great! What a cool print! I didn't take part last year at all so I am pumped to take part this year. I'm cutting it even closer than you though so fingers crossed I get done in time. Love this print! It's very Megan like and I'm a lover not a hater. Looks great on you! I love the print and I love Megan too!!! She's sooo attractive, I think it's her mouth/teeth, something! So hot!!!!!! This is a very lovely version of the Elizalex!! It's soooo groovy (had to say it!) I really adore those colors, and the 60s look really suits you! AMAZING DRESS!! You look fantastic! 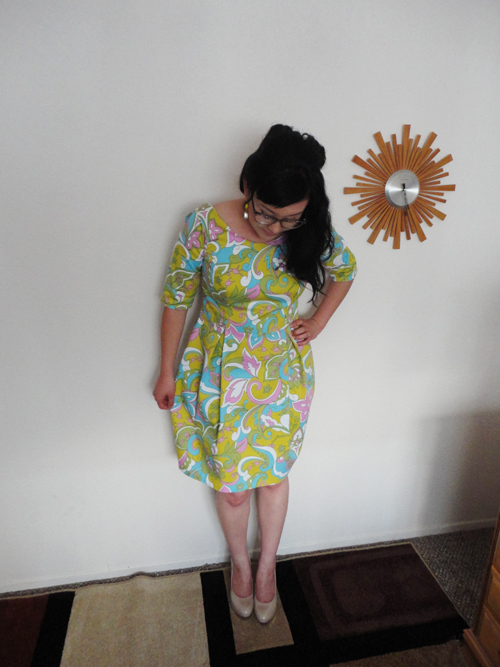 I just love you in fun 60's prints like this :) Yay for you!! I love how this dress turned out!! The fit is spot on and I love how the fabric is really set off by the simplicity of the dress design. The hem looks great on you too, Sorry it was such a pain, but your effort was worth it ;) Great job, girl! Wow, you always find such crazy fun fabric! This looks adorable! :D Well done! Girlfriend. This is STUNNING. 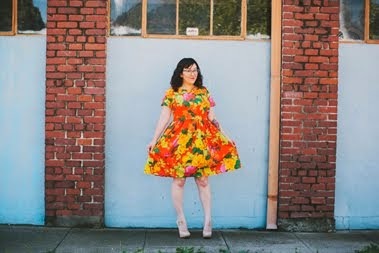 I want this dress so badly-- you've used the perfect fabric! The fit looks great, too! It looks SOOO good, Erin!!!!!! The dress looks great!! So pretty! Definitely something Megan would wear. I think the actress that plays Megan is beautiful but I'm just not a fan of her character. I'm with the old guard, loving old school characters like Betty and Joan. They are somewhat stuck in the late 50's early 60's. Megan is so modern and independent! 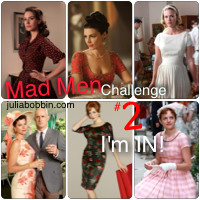 I also participated in the Mad Men Challenge, I can't wait to see what everyone has come up with! Great job with the fit, it looks amazing on you! 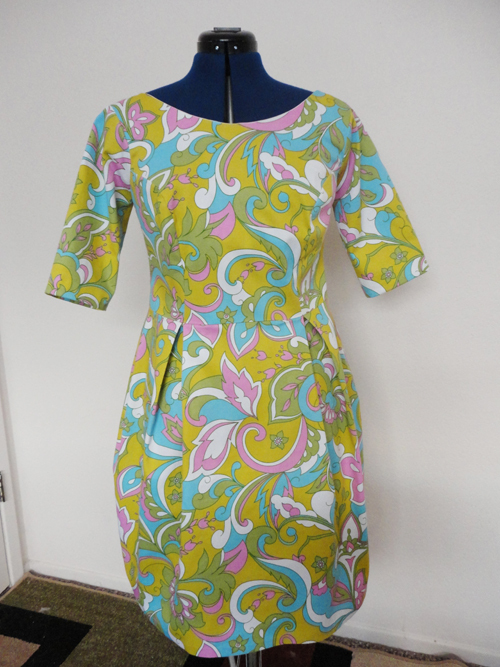 I love this fabric, so 60's!! Beautiful dress, and very Megan! I'm a Megan lover as well, but I haven't watched any of the current season yet, so my perception is not up-to-date! What a great dress! I absolutely love that fabric! Beautiful fabric and dress! And also... who hates Megan??! Seriously? Who hates Megan? Fabulous choice of fabric for your Elisalex. And you look adorable in it!